If you're tired of showing up at the Doughnut Vault only to discover they've sold out, you have a new backup plan. 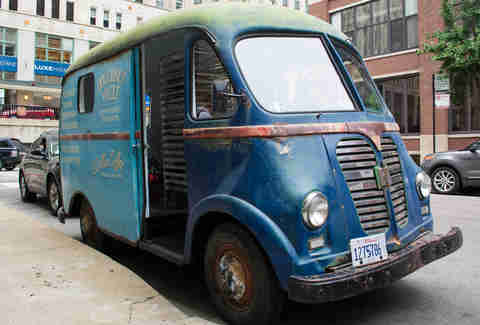 Brendan Sodikoff's small-but-mighty shop has launched its patina’d pastry van into the concrete jungle, and while it may not blow anyone away with its horsepower, it is packed floor to ceiling with racks of doughnuts, and Kelley Blue Book simply can’t put a price on that. The van is pushing six types of doughnuts, including the sweet old-fashioned buttermilk glazed, plus a daily surprise special. Doughnut Vault teamed with Vintage Step Vans to restore a 1957 International Metro that has had two previous lives as an Air Force rig and a mail truck. The old workhorse has finally found its true calling: slinging doughnuts to the hungry people of Chicago. Follow @VaultVan_G to see if it’s cruising your ‘hood, as the truck runs on equal parts gasoline and social media. 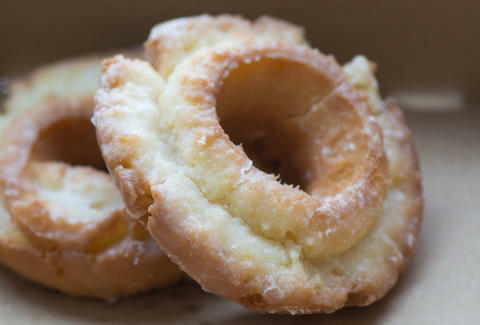 If you’re feeling something that rides the line between sweet and tart (and don't have to pass a drug test for work), have a go at these lemon doughnuts coated in a lemon & poppy seed glaze. 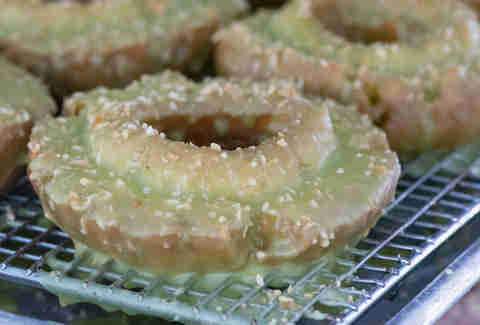 It ain’t easy being green... unless you’re the Hulk, money, or this pistachio glazed doughnut. 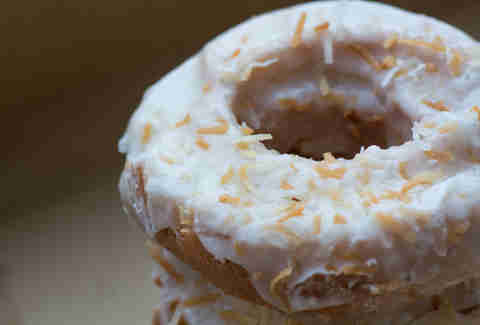 If you’d like a taste of island life without the worry of pirates or scurvy, here’s a coconut cream old-fashioned doughnut encrusted in toasted shredded coconut. 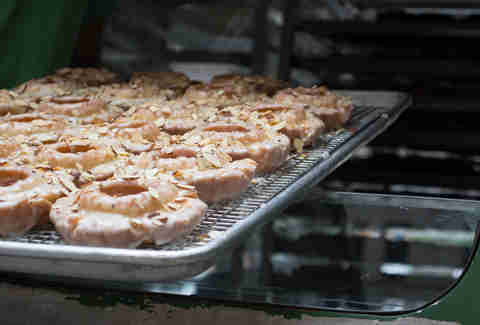 If someone in line shouts “nice rack,” they’re not pointing out your moobs -- they’re just noticing the confection rack with almond glaze-drenched doughnuts topped with toasted almonds. The addition of a blueberry glaze (antioxidants!) 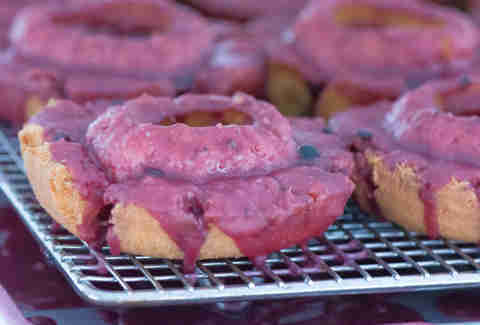 makes these blueberry old-fashioned doughnuts part of a complete breakfast. 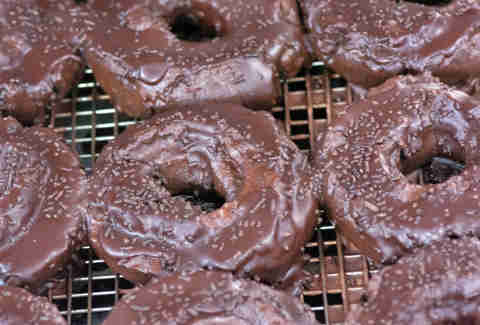 With chocolate-y fried dough smothered in chocolate glaze and a hailstorm of chocolate sprinkles, these chocolate doughnuts are the quintessential triple threat... or even quadruple threat, if you count diabetes.